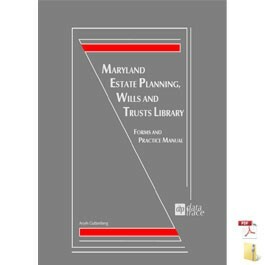 Prominent Maryland attorney, Aryeh Guttenberg, Esq., has drawn from his extensive experience to bring you insightful strategies and relevant forms for virtually every estate-planning situation you may encounter in this newly revised manual featuring more than 370 electronic forms. This extensive, updated Manual, featuring 1,660 pages of content, will help you stay current and efficient by providing appropriate statutes and regulations—complemented by thorough discussions and analyses of the changing federal and Maryland state laws. Plus, you’ll be expertly guided through an extensive selection of wills and trusts forms using an easy-to-follow, situation-oriented format. Included are client presentation charts and customizable electronic forms for wills and trusts as well as explanations and planning strategies for estate, gift, and generation-skipping tax.